In the springtime, the atmosphere heats up and kick-starts the vines back to life. They embark upon a new growth cycle, which ends when summer is over, after the harvests. After winter is done, there is much work to do. The winemakers are very busy in the vines, preparing for the new vintage. Now, each winegrower is left to make up his or her mind about when to harvest, depending on the maturity of the grapes and the weather. This requires careful attention and an in-depth understanding of each plot. That’s why, during the days just before the harvest, you will probably see men and women walking through the vines with a serious look on their faces as they taste the berries. They’re not scrumping fruit for pleasure, but instead, are evaluating the maturity of the grapes to work out when is the best time to send in the pickers ! In early spring, the first efforts involve working with the soil. 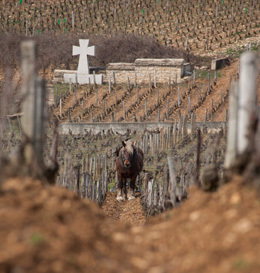 • Débuttage: The soil that was earthed up to protect the vines during winter is now removed from around the plants. This helps aerate and even out the soil. • Bouéchage: This local dialect word describes the action of chipping away at the vine root with a mattock to remove excessive root growth. • Griffage: This task involves scratching the surface of the land around the vines with pronged tool to remove weeds, aerate the soil and help the nutritious elements penetrate back into the soil. • Planting and replanting: New vines are planted out during this period, where necessary. Weeding or mowing: The presence of grass between the rows is desired in some plots to help suppress vine growth. In these plots, the grass needs to be mowed regularly. Where grass is not required, these plots need to be weeded regularly. In the Bourgogne winegrowing region, this task is increasingly done using mechanical rather than chemical means. When the fine weather returns, the winegrower has several tasks that help encourage vigor in the vines and the development of high-quality grapes. • Tying up, training and tucking in the vines : In the Bourgogne winegrowing region, the vines are supported by metal wires stretched between posts to ensure the grapes get the best exposure to the sun (trellising). o Tying up: The winegrower attaches the canes to the lowest wires. This helps channel plant growth and encourage them to develop fruit. o Training: As the canes grow, they are guided upwards and attached to the wires. This takes place throughout the summer months. o Tucking in: Because vines are creepers, they tend to grow in all directions. To encourage them to grow in rows, the canes are pushed between the second row of double wires. • Éjetonnage: This dialect word has plenty of local variations (such as évasivage). The equivalent in French is ébourgeonnage or debudding. 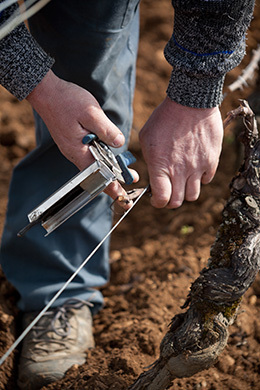 The task is carried out by hand and involves removing the “gourmands” or the young elbow shoots that give no fruit and can divert the vine from focusing its attention on developing fruit-bearing canes and grapes. • Protecting the vines: The vines must be protected against certain diseases such as downy mildew, powdery mildew and botrytis. • Trimming: This task involves removing the tips of the canes to encourage fruit development. Another advantage is that this facilitates movement between the rows. • Vendanges vertes: Just before véraison (when the grapes take on color), the vendange vert or green harvest takes place. The winegrowers may remove the excess bunches from vines, but this is not systematic. The remaining bunches can then reach optimum maturity. • De-leafing: Depending on the weather experienced during the year, the winegrower may decide to remove some of the leaves while the grapes ripen. Only leaves facing the rising sun in the east are removed. This technique helps the grapes to ripen and offers improved aeration. Moreover, it makes the task of manual harvesting much easier. Ready for the harvest ! In September or October, the final phase of a whole year of hard work finally arrives. It’s time for the harvest in the Bourgogne winegrowing region. The grapes are picked and returned to the winery for vinification. The aromatic characteristics of Bourgogne wines reflect the conditions experienced by the vines throughout the annual growth cycle.